Improvement of the technologies used by rural areas is a key factor to the development of India’s rural population. Rural Technology Action Group (RuTAG) at IIT Delhi has worked in this direction to integrate Research and Development with the Dissemination and Delivery Mechanism of suitable technologies for rural sectors. 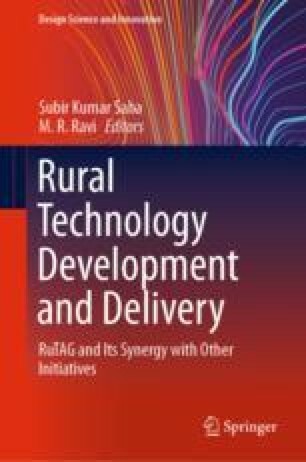 This paper discusses need-based technologies designed and developed by RuTAG IIT Delhi, and the problems faced during development and dissemination. To develop interest among students of IIT Delhi on rural technologies, RuTAG Club was initiated by RuTAG IIT Delhi. Several orientation sessions were organized for several years to boost student participation and create awareness. As a result, many academic projects were undertaken by the students who were happy to apply their knowledge for a social cause while being able to see their designs coming to live demonstrations/utilization. The authors sincerely thank the financial support from the Office of the Principal Scientific Adviser to the Govt. of India, Vigyan Bhawan, New Delhi to RuTAG (Rural Technology Action Group). The encouragement of Dr. Ketaki Bapat (Scientist ‘F’), Prof. R. R. Gaur (Chairman, RuTAG IIT Delhi), Prof. Rajendra Prasad (Co-PI), Prof. V. K. Vijay (Co-PI), Prof. M. R. Ravi (Co-PI), Prof. Sangeeta Kohli (Co-PI), IIT Delhi, is highly appreciated. The authors also thank all the field agencies, namely, Lupin Human Welfare and Research Foundation, Bharatpur, Rajasthan; Gramodaya Rachnatmak Vikas Sansthan, Deoria, Uttar Pradesh; Ram Krishna Jaidayal Dalmia Seva Sansthan, Chirawa, Rajasthan; Jansamarath, Vishnu Garden, Delhi; M/s. Panchal Pumps and Systems Pvt. Ltd., Kanpur, Uttar Pradesh; International Development Enterprise in India (IDEI), Dwarka, New Delhi, and Sindhuneel Projects and Engg. LLP, Kaushambi, Ghaziabad, Uttar Pradesh for their support and feedback associated with their technology upbringing.